© 2018 Malinina et al. 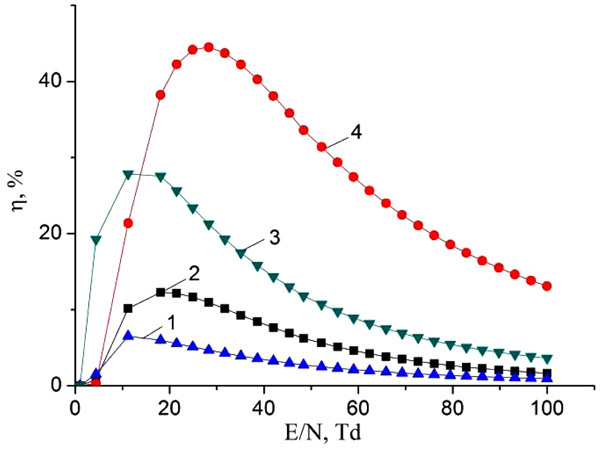 The spectral, energy and electrical characteristics of the plasma of a dielectric barrier atmospheric pressure nanosecond discharge on a mixture HgI2/HgBr2/He are investigated. The discharge was initiated by a pulse-periodic voltage with a pulse repetition rate 5-20 kHz of positive polarity, an amplitude 25.5 kV, and a half-height duration 150 ns. The emission of exciplex molecules HgI (B2Σ+1/2-X2Σ+1/2) and HgBr (B2Σ+1/2-X2Σ+1/2) was studied. Based on a comparison of the temporal behavior of the spectra of B-X transitions of HgI, 444 nm, and HgBr, 502 nm molecules, the mechanism of simultaneous formation of the exciplex molecules HgI* and HgBr* is determined. Based on the numerical solution of the Boltzmann equation for the electron energy distribution function, the energy and velocity distributions of the processes responsible for the emission of HgI and HgBr molecules are analyzed. The studies revealed the possibility of optimizing the pulsed power to obtain a simultaneous emission in the visible (violet-blue and blue-green light) spectral range in atmospheric pressure discharge in the HgI2/HgBr2/He mixture. When a short powerful pulse of several nanoseconds in duration (3-5) ns is used to obtain a relatively high initial ion ionization (1012-1013 cm-3), followed by a long pulse of tens or hundreds of nanoseconds, depending on the component composition of the mixture and pressure with relatively low electric fields, a mixed power source will ensure efficient excitation of HgI* and HgBr* molecules and may be the optimal solution for the discharge lamps based on HgI* and HgBr* emission. Keywords: Optical emission, Dielectric barrier discharge, Mercury monoiodide, Mercury monobromide, Helium, Parameters. Emission characteristics and plasma parameters are important both for improving existing ones and for creating new sources of radiation . Plasma on mixtures of mercury diiodide and mercury dibromide vapor (HgІ2 and HgBr2) with atomic gases can be an effective source of two-band coherent and spontaneous emission in the violet-blue and blue-green spectral range with a maximum emission at a wavelength of (λmax) 444 nm and (λmax) 502 nm [2, 3]. The light sources that operate on these mixtures provide a high spectral power of radiation, important for practical applications, such as sources of active photosynthetic radiation or lasers and others [3-7]. The high efficiency of radiation of such mixtures was demonstrated by the authors [8-10]. The experiments were carried out with pulsed-periodic pumping (pulse duration 150 ns) at 0.5-10 kHz. Simultaneous emission of exciplex molecules HgI* and HgBr* was observed at the wavelengths (λmax) = 444 nm and (λmax) = 502 nm, respectively. The present work is devoted to the investigation of the optical emission (350-700 nm) of the discharge, which was created by a pulse-periodic (5-20 kHz) high-voltage voltage of nanosecond duration (150 ns) in HgI2/HgBr2/He mixture. Based on experiments and numerical calculations of plasma parameters, the mechanism of formation of the exciplex molecules HgI* and HgBr* is analyzed. Investigations of the optical emission of a barrier discharge plasma in a mixture of mercury diiodide and mercury dibromide vapor with helium were performed in a device (radiator) which construction is shown in Fig. (1). As a barrier, quartz glass was used. The plasma of the barrier discharge in the investigated mixture was created in the interelectrode gap inside a cylindrical device made of a quartz glass tube (1) with an external diameter 34 mm and a length 200 mm. Fig. (1). The design of the radiator: 1-tube, 2-internal electrode, 3-external electrode, 4-metal input, 5-capillary. The distance between the inner electrode (2) of the circular section (diameter 4 mm) and the outer electrode (3) was 15 mm. The internal electrode is located along the axis of the tube, and the outer electrode (perforated with a transmittance of radiation 70%) - on the surface of the tube. The ends of the tube are welded, on one of them, the metal input (4) is welded, which provides the supply of energy from the power source to the electrode. On the opposite end surface there is a branch pipe (5) made of quartz glass with a capillary (diameter 1 mm, length 20 mm) through which the tube was evacuated and filled with helium. The discharge was supplied from a generator of nanosecond duration pulsed-periodic pulses. During the experiments, the pulsed voltage and current (pulse duration ~ 150 ns) on the emitter electrodes were maintained at 22-30 kV and 265-280 A, respectively, the pulse repetition rate was 5-20 kHz. The radiation was lead out from the central region of the interelectrode gap and analyzed in the visible and near UV regions of the spectrum using the optical system of the experimental setup, namely, the 3PM-3 monochromator and the photomultiplier FEU-106 (Fig. 2). When studying the amplitude-time characteristics of the emission in the registration system, an electronic linear multiplier 14 ELU-FS was used instead of the FEU-106 photomultiplier. The spectral resolution of the 3PM-3 monochromator was 44 Å at a wavelength λ = 434 nm. 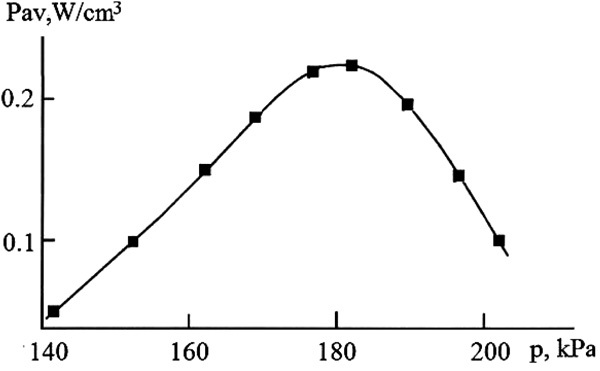 The optical system was calibrated by the radiation of a standard band tungsten lamp SI 8 - 200 at a filament temperature T = 2173 K.
Fig. (2). 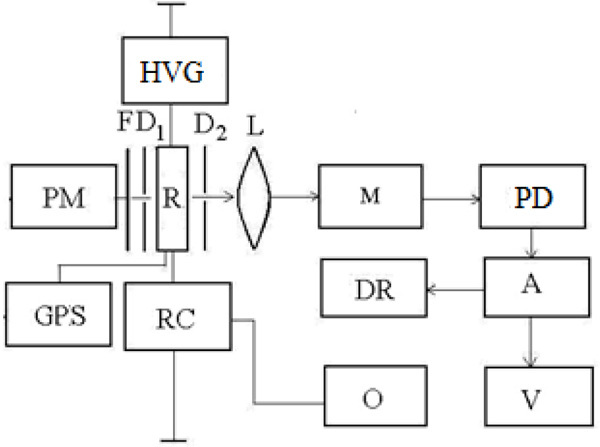 Block diagram of the experimental setup: R - emitter, HVG - high voltage generator with pulse periodic form, M - monochromator, PD - photodetector, A - amplifier, DR - recorder, V - voltmeter, O - oscilloscope, RC-Rogovsky coil, GPS-vacuum pumping and gas filling system, PM-power meter, L, D1, D2, F-lens, diaphragm and filter, respectively. Registration of voltage pulses and discharge current of the radiation source was carried by the two beam oscilloscope S8-2, on which the signal from the voltage divider was applied and the integrating circuit calibrated Rogowski coil. The average radiation power was measured with the help of the Quartz-01 instrument. The investigating mixture was prepared directly in the interelectrode gap. Mercury dihalides: mercury diiodide and mercury dibromide in an amount 80 mg were pre-loaded into the interelectrode space. The outgassing of the surfaces of the elements of the internal volume of the tube was carried out by heating it at a temperature 50° C and pumping to a residual gas pressure 1 Pa for 2 hours. The partial vapor pressure of HgI2 and HgBr2 in the mixture was created by heating the mixture during the dissipation of the energy of a pulsed-periodic discharge. It was measured by the temperature of the coldest part of the tube on the basis of linear interpolation of the reference data . The partial pressure of helium was measured by an exemplary membrane manometer. Emitter radiation spectra were studied in the partial pressure range of mercury diiodide and mercury dibromide 0.1 - 0.5 kPa, and helium 100-180 kPa. The overview spectrum of the radiation at a pulse repetition rate f = 18 kHz is shown in Fig. (3). The voltage amplitude at the electrodes and current through the gas-discharge gap is 25.5 kV and 280 A, respectively. The total pressure of the mixture is 162.8 kPa. Characteristic for this mixture is the presence of systems of spectral bands of the electron-vibrational transition of exciplex HgI* and HgBr* molecules 5 and 7 nm wide with emission maxima at wavelengths λ = 444 nm and λ = 502 nm, respectively , a steep increase in the intensity of these spectral bands from the side of the long-wave region and a slow decline in the short-wavelength region.The intensity of the spectral band at wavelengths λ = 444 nm is 2.5 times higher than the intensity of the spectral band at wavelengths λ = 502 nm. The edges of the spectral bands overlap the wavelength range 350-510 nm. In addition to these spectral bands, radiation is also observed on the lines λ = 365 nm and λ = 546 nm of mercury atoms, the 6р3Р20 –6d3D3 and 7s3S1 - 6p3P 02 transitions [14, 15], the λ = 587 nm lines of helium atoms, the 2p3P2,1–3d 3D3,2,1 transition, and in the long-wave region (λmax = 600-750 nm) emission of the spectral bands of the helium molecule is observed . With a change in the repetition rate of the pump pulses from 5000 Hz to 20,000 Hz, the radiation intensity in the spectral bands and lines increases. Fig. (3). Overview spectrum of radiation of a barrier discharge plasma. Partial pressures: mercury diiodide 0.25 kPa, mercury dibromide 0.5 kPa, helium 162 kPa. The amplitudes of voltage and current pulses are 25.5 kV and 280 A, respectively. The results of investigations of the integral characteristics (the dependence of the average radiation power on the partial pressure of the helium buffer gas, as well as the operating time of the emission source on one portion of the working mixture, are shown in Figs. (4 and 5). It was established the following: with an increase in the partial pressure of helium from 140 kPa to 200 kPa, an increase in the average power is observed, reaching its maximum specific value 235 mW/cm3 at 180 kPa and with a further increase in the pressure of helium - a drop. Fig. (4). The dependence of the specific average radiation power on the partial pressure of helium. The repetition rate of the pump pulses is 18 kHz, the amplitude of the voltage pulse is 25.5 kV. The dependence of the radiation power of mercury monohalides in relative units on the number of pump pulses is shown in Fig. (5). Saturation of the radiation power occurs for the exciplex HgI* molecules after 5 ∙ 107 pulses, and for the HgBr* molecules earlier in time (4 ∙ 107 pulses). Fig. (5). The dependence of the radiation power of mercury monohalides on the total number of pulses: 1. HgI* molecule, 2. HgBr* molecule. The total pressure of the mixture is 162.8 kPa. The repetition rate of the pump pulses is 18,000 Hz. The results of studies of the temporal characteristics of the radiator are shown in Fig. (6) with the experimental conditions most optimal in terms of radiation power. Accuracy and reproducibility of the results of oscillographic measurements were 10% and 90%, respectively. Current pulses (I) are of different polarity. Their complex form is caused by the charge-exchange of the “dielectric-plasma” circuit. The amplitude and duration are ~ 280 A and ~ 150 ns, respectively. Radiation pulses (P) are of the same polarity. The pulse duration at half-maximum was ~ 100 ns and ~ 150 ns for the HgI * and HgBr * molecules, respectively. Specific power in the pulse of radiation is -52 W/cm3. Fig. (6). Oscillograms of current pulses (I) and radiation (P): --- HgI* molecule, - HgBr* molecule. The total pressure of the mixture is 162.8 kPa. The repetition rate of the pump pulses is 18 kHz. For emission of exciplex molecules, both HgI* and HgBr*, a two-humped time dependence is observed. The amplitudes of current and radiation pulses in time coincide within the limits of the measurement error (10%). The amplitude of the second radiation pulse for these molecules is higher than the first. The second pulse of radiation is characterized by an increase in its duration in comparison with the first pulse. The parameters of the barrier discharge plasma in the optimum for obtaining the maximum radiation power of the mixture HgI2-HgBr2-He (0.18% -0.31% -99.51%) at a total pressure 162.8 kPa were determined numerically and were calculated as the total integrals of the electron energy distribution function (EEDF) in the discharge. EEDF were numerically determined by solving the Boltzmann kinetic equation in the two-term approximation . The EEDF calculations were carried out using the program . On the basis of the EEDF obtained, mean electron energy, the specific power losses of the electric discharge on various elementary processes in the plasma, as well as the rate constants of elastic and inelastic scattering of electrons by mercury diiodide molecules and helium atoms, depending on the magnitude of the reduced electric field (E) to the total concentration of mercury diiodide molecules and helium atoms (N)) have been obtained. The range of changes in the parameter E/N = 1-100 Td (1·10-17 - 1·10-15 V · cm2) included the values ​​of the parameter E/N, which were realized in the experiment. In the integral of collisions of electrons with helium atoms and mercury dibromide and mercury diodide molecules, the following processes of elastic and inelastic collision are taken into account: elastic scattering, excitation of the energy levels of the He atom (23S, 21S, 23P, 21P, 3SPD, 4SPD, 5SPD), ionization of the helium atom, excitation of HgBr2 molecules, excitation of (HgBr2 (D)) states of HgBr2 molecules, dissociative excitation of mercury monobromide (X2Σ+1/2, B2Σ+1/2 - states), attachment, ionization, dissociative excitation of B2Σ+1/2 – state mercury monoiodide and ionization of molecules of mercury diiodide. Data on the absolute values ​​of the effective cross sections of these processes, as well as their dependence on the electron energies, are taken from [18-22]. Fig. (7) shows the characteristic shape of the EEDF with a change in the reduced electric field strength (E/N) in the range 1-100 Td. An increase in its magnitude leads to an increase in the number of “fast” electrons in the discharge. Mean energy of the discharge electrons increases sharply from 0.48 to 1.7 eV with an increase in the E/N parameter from 1 to 4.4 Td. With further growth of the reduced electric field, the rate of increase in mean electron energy slows down and reaches a value 11.5 eV for E/N = 100 Td. Fig. (7). The electron energy distribution functions in the mixture: HgBr2: HgI2: He = 0.0031: 0.0018: 0.9951 at a total pressure of the mixture P = 162.8 kPa for the values of the parameter E/N: 1 (1), 25.8 (2), 50.5 (3), 75.3 (4), 100 (5) Td; on the inset - the dependence of mean electron energy on the parameter E/N. The value of the reduced electric field, namely 68.5 Td, at which the experimental studies were carried out, mean electron energy and their temperature were equal to 9.1 eV and 105560 K, respectively. The concentration of electrons on the surface of the inner electrode for a current amplitude 280 A was 4.6 ∙ 1017 m-3. Fig. (8) presents the results of studies of the dependence of the rate constants of the inelastic collision of electrons with mercury dihalide molecules on the parameter E/N. 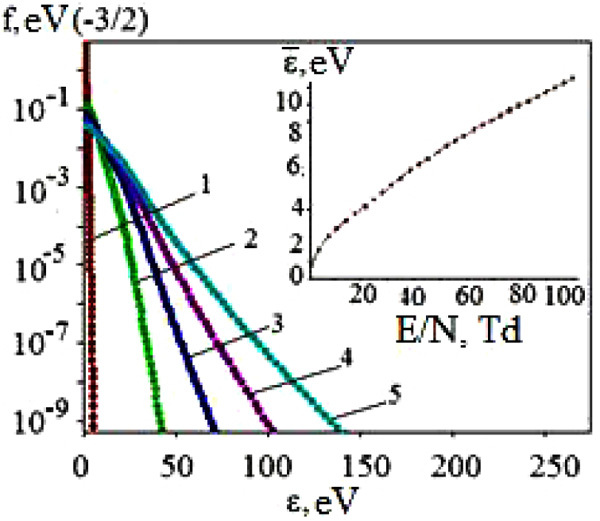 For the value of the reduced electric field equal to 68.5 Td, at which experimental studies were carried out, the rate constants of dissociative excitation by electrons of В2Σ+1/2- state of the molecules of mercury monoiodide (1) and mercury monobromide (2) have values ​​1.9 × 10-14 m3/s. Fig. (8). The dependence of the rate constants of electron collisions with the components of a gas-discharge plasma on a mixture HgBr2-HgI2-He = 0.0031-0.0018-0.951 at a total pressure 162.8 kPa on the parameter E/N: 1-dissociative excitation of В2Σ+1/2- state of HgI* molecules, 2 - dissociative excitation of В2Σ+1/2-state of HgBr* molecules, 3-dissociative excitation of X2Σ+1/2-state of HgBr molecules, 4-excitation of (HgBr2 (D)) state of HgBr2 molecules. Fig. 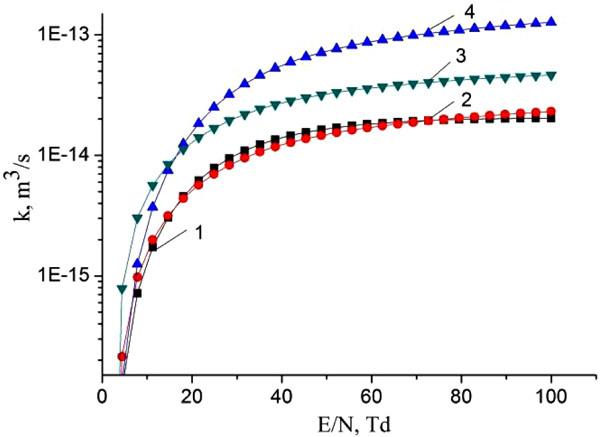 (9) presents the results of an investigation of specific losses at the discharge power on inelastic electron collisions with mercury HgІ2 and HgBr2 molecules in a mixture of mercury diiodide and mercury dibromide vapor with helium as a function of the reduced electric field strength. It is observed a regularity in this dependence. The proportion of the specific discharge power on processes of dissociative excitation of mercury monobromide and mercury dibromide exciplex molecules increases with the parameter E/N. It reaches a maximum 12.2%, 45.1% and 6.4% at values ​​of the parameter E/N equal to 21.5, 28.3 Td and 11.2 Td for electronic states: mercury monobromide - B2Σ+1./2, mercury dibromide - (HgBr2 (D)) and mercury monoiodide - B2Σ+1./2, respectively. With a further increase in the parameter E/N, the fraction of the specific power of the discharge going on the processes of dissociative excitation of the exciplex molecules of mercury monobromide and mercury monoiodide decreases. Fig. (9). The dependence of specific power losses on the electron collision in a mixture of mercury dibromide and mercury diiodide vapor with helium on the reduced electric field strength (E/N): 1 - dissociative excitation of the В2Σ+1/2-state of HgI* molecules, 2 - dissociative excitation of В2Σ+1/2-state of HgBr* molecules, 3 - dissociative excitation of the Х2Σ+1/2-state of HgBr* molecules, 4- excitation of the electronic state of mercury dibromide (HgBr2 (D)). where X is the halogen atom (I, Br), M is the concentration of quenching molecules and atoms (HgX2, He,), respectively, ΔE1,2 - is the energy difference in the reactions (4). Reactions (1) and (2) are the main sources of the formation of exciplex HgX* molecules [19-24]. Their rate constant has the value 1.9 × 10-14 m3/s (Fig. 8) for our experimental conditions at a value of the reduced electric field strength equal to 68.5 Td. In addition, complex molecules of HgІ2 and HgBr2 molecules are formed due to reactions (3, 4) due to the excitation of molecules of mercury diiodide and mercury dibromide by electrons to state D . The rate constant has a value 9.9 × 10-14 m3/s for HgBr2 molecules (Fig. 8). This state of the mercury dihalide molecules is the sum of all states that are located between the threshold energy and the ionization energy. Emission from D states of HgX2 molecules is not observed, due to the fact that these states are predissociated with the formation of molecules of mercury monohalides in (C, D) states. Emission from C and D states of HgІ and HgBr molecules under our experimental conditions is not observed because of the high efficiency of the quenching process (4) (The product of the rate constant of quenching by helium the С2Π1/2 -state of mercury monoiodide molecules on the lifetime is equal to 4.2 ∙10-18 cm3, and the quenching by mercury dihalides of states (C, D) can occur more efficiently [26, 27]). The population of these states is transferred to the - state of HgІ and HgBr molecules or to other non-optical channels . The reaction of collision of mercury dihalide molecules with electrons (5) is a channel for the formation of mercury monohalide molecules in the ground state, the rate constant has a value 3.9∙10-14 m3/s (Fig. 8). Electron-vibrational transitions B2Σ+1/2 → x2Σ+1/2 of HgІ and HgBr molecules lead to the emission of spectral bands with maximum intensity at λmax = 443 nm and λmax = 502 nm (reaction 6). In the quenching reaction (7), an electronic-vibrational transition of mercury dihalide molecules to their ground state without radiation occurs. The rate constant of this process for quenching the mercury monoiiodide and mercury monobromide molecules by helium molecules is <2.9 ∙ 10-20 m3/s and <3.4 ∙ 10-20 m3/s, respectively  and by mercury dihalides is 1.1 ∙ 10-16 m3/s and 3 ∙ 10-16 m3/s . Dissociate into mercury and halogen atoms in collisions with electrons . Halogen atoms can escape to the surface of the electrode and form metal halides . Mercury atoms accumulate and, in collisions with electrons, are excited and give radiation λ = 365 nm and λ = 546 nm. The sharp increase in the intensity from the part of the spectrum with large wavelengths and the slow decay in the short wavelength region (Fig. 2) for both the HgІ and HgBr molecules is explained by the progress of the potential curves (the excited B2Σ+1/2 – state is shifted in the direction of large internuclear distances of the relative X2Σ+1/2 - state) and relaxation processes of the population of the upper vibrational levels of the excited electronic state, which occur more rapidly than the electron-vibrational transition to the ground X2Σ+1/2- state [30, 31]. The increase of intensity of HgI molecules emission in comparison with the intensity of HgBr molecules emission at identical values of the excitation rate constants (1.9 × 10-14 m3/s, Fig. 8) is caused by the quenching process of the B2Σ+1/2 - state of mercury monohalide molecules by mercury dihalide molecules (reaction 7). The rate constant of quenching of the B2Σ+1/2 - state of monoiodide molecules has a value 1.1 ∙ 10-10 cm3/s, and monobromide molecules - 3.4 ∙ 10-10 cm3/s , which gives a difference in the radiation intensities of these molecules. First of all, the dependence of the radiation power on the partial pressure of helium (Fig. 4) is due to the following processes: an increase in the electron concentration with an increase in the partial pressure of helium in the mixture, a change in the fraction of the discharge energy that is spent on heating the working mixture; the change in mean electron energy and the excitation rate constants of the molecules HgI and HgBr as a function of the values ​​of the E/N parameter, as well as the quenching of the B2 Σ+1/2 – state of the HgI and HgBr molecules upon collision with helium atoms and mercury dihalide molecules. As the partial pressure of helium increases in the mixture, the value of the parameter E/N decreases. This leads to an increase in the specific losses of the discharge power on the elastic scattering of electrons by atoms and molecules, and, accordingly, to an increase in the partial pressure of mercury diiodide and mercury dibromide vapor and the radiation power of the exciplex molecules of HgI and HgBr. In addition, the increase in the radiation power with increasing partial pressures, both helium and mercury diiodide and mercury dibromide vapor, is also facilitated by an increase in the electron concentration, which increases with increasing concentration of the components of the working mixture . The presence of a maximum and a further decrease in the radiation power of the exciplex molecules HgI and HgBr with an increase in the partial helium pressure is associated with a decrease in the fraction of the discharge energy that is spent on the excitation of their B2 Σ+1/2 – state (Fig. 9), as well as the quenching process this state of mercury monohalide molecules when they collide with helium atoms . where ΔE3,4 - the difference in energy in the reactions. Earlier achievement of saturation in the emission intensity of HgBr* molecules on the number of pulses than for HgI* molecules (Fig. 5) is caused by a greater loss of discharge power on the dissociative excitation of B2Σ+1/2 – state of HgBr* molecules compared to the HgI* molecules (Fig. 9). The recombination process of positive ions of mercury dihalides with electrons (17), according to the authors , can play an important role at current densities ~ 1000 A/cm2, which is not observed under the conditions of our experiment. The calculated rate constants of the recombination process (11) of a positive ion with a negative ion are high (for HgI2 and HgBr2 ~ 3·10-7 cm3/s), however, in gas-discharge conditions due to small concentrations of atomic ion (the rate constant of the process of formation of negative ions I-, Br- ~ 10-10 cm3/s ), its role is insignificant. The excitation of radicals HgX (X2Σ+1/2) by electrons in the B2Σ+1/2- state (19) is possible under our experimental conditions. 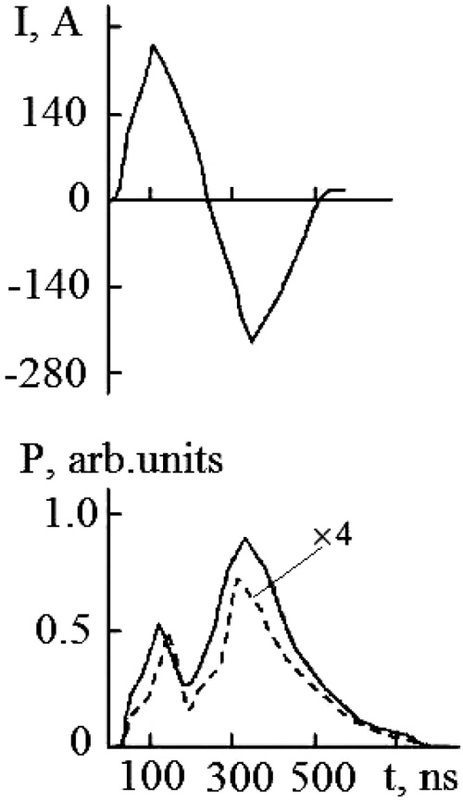 The regularity of the difference in the magnitude of the amplitudes of the first and second radiation pulses (Fig. 6) is explained in the following way. The first and second pumping (current) pulses form molecules of mercury monoiodide and mercury monobromide in B2Σ+1/2 and Х2Σ+1/2 – states due to the dissociation of mercury dihalide molecules upon collision with electrons. 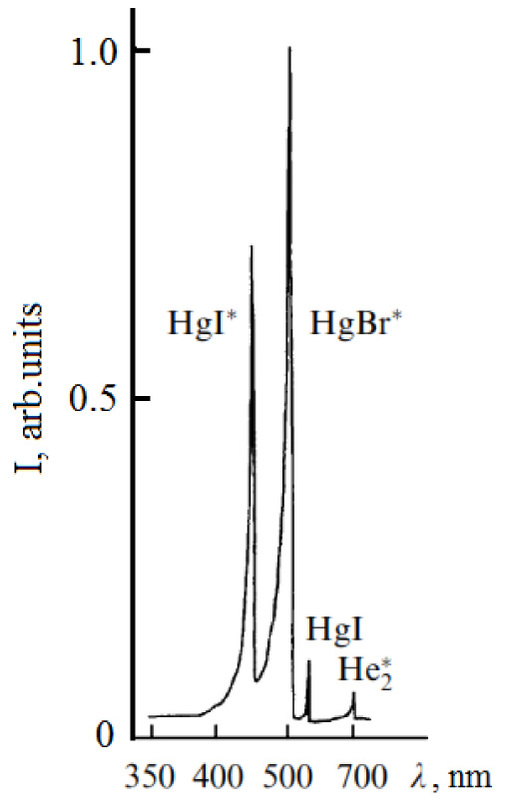 The second pump pulse (current) also leads to an additional increase in the population of B2Σ+1/2 –state of mercury monobromide molecules due to the process (19), where HgХ(Х 2Σ+1/2) molecules of HgI and HgBr in the ground state and which did not have time to recover into triatomic molecules (mercury diiodide and mercury dibromide) in the interimpulse period (150 ns) in the processes (13,14), which leads to an increase in the amplitude of the second radiation pulse and an increase in its duration Δτ as compared to the first pulse . 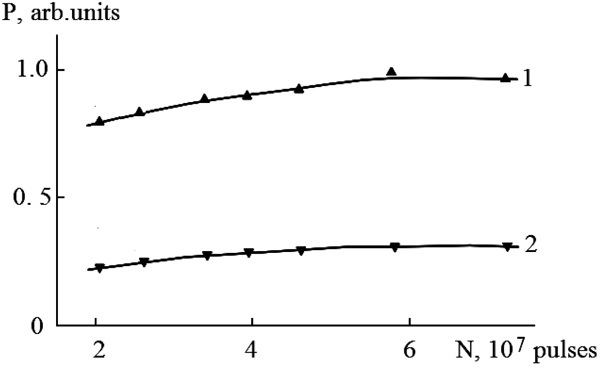 Based on the calculated reaction rates (Fig. 8) and the energy distribution (Fig. 9) as a function of E/N, it becomes possible to assume the optimal power input scheme in order to obtain the maximum possible emission from the simultaneous violet-blue (λ = 444 nm) and blue- green (λ = 502 nm) spectral ranges for the HgI2/HgBr2/He mixture. Indeed, excitation of the states of the main reactions reached a maximum at about 11-30 Td (see Fig. 9). Such a field is too small for effective ionization of the mixture, ionization and stable development of the discharge at a pressure higher than 1 atm requires a much higher electric field, at least 100 Td. Thus, when a short powerful pulse of several nanoseconds in duration (3-5) ns is used to obtain a relatively high initial ion ionization (1012-1013 cm-3), followed by a long pulse of tens or hundreds of nanoseconds, depending on the component composition of the mixture and pressure with relatively low electric fields, a mixed power source will ensure efficient excitation of HgI* and HgBr* molecules and may be the optimal solution for the discharge lamps based on HgI* and HgBr* emission. Simultaneous emission from two exciplex molecular bands HgI* (λ = 444 nm) and HgBr* (λ = 502 nm) in a nanosecond dielectric barrier discharge in a mixture HgI2: HgBr2: He=0.0018: 0.0031: 0.9951 was observed at atmospheric pressure. Specific emission powers in one pulse equal to 52 W/cm3 and average specific emission power equal to 235 mW/cm3 have been achieved at a repetition rate of 18 kHz, respectively. Long-term emission over 7 ∙ 107 pulses was found to be stable (within the error of measurement of 10%). The shape of the current and the emission of HgI* and HgBr* molecules with a time resolution is studied. It was established that the HgI* molecule emission repeats the shape of the HgBr* emission. Based on the analysis of possible excitation and quenching reactions, it is established that the population of the exciplex molecules of the HgI* and HgBr* B2Σ+1/2–state is mainly due to dissociative excitation in collisions with electrons. A discussion is given of additional processes that increase the population of the upper B2Σ+1/2–state of mercury monohalides. As a result of calculating the reaction rates and the energy distribution for a different electric field, it can be concluded that a combination of a high electric field at the discharge front and a low field during the pulse duration can be used to increase the emission power in the investigated mixture. Based on the results of investigations of the emission of a barrier discharge plasma in a mixture of mercury diiodide and mercury dibromide vapor with helium, an effective source of simultaneous two-band emission in a violet-blue and blue-green spectral ranges can be created which will find application as a source of active photosynthetic radiation and a laser in the field of biotechnology, photonics, medicine, etc. Raizer YuP. Gas Discharge Physics 1991. McDaniel EW, Nigan WL. Gas Lasers 1982. Kogelschatz U. Ultraviolet excimer radiation from nonequilibrium gas discharges and its application in photophysics, photochemistry and photobiology. J Opt Technol 2012; 79: 484. Berry AJ, Whitehurst C, King TA. Multihalide operation of mercury halide lasers. J Phys D Appl Phys 1988; 21(1): 39. Bazhulin SP, Basov NG, Bugrimov SN, et al. Blue-violet Hgl/Hgl2 laser with wide-band optical pumping by a linearly stabilized surface discharge. Soviet Journal of Quantum Electronics 1986; 16(5): 663. Posudin YuI. Laser Photobiology 1989. Romanenko VD, Krot YuG, Sirenko LA, Solomatina VD. Biotechnology of Hidrobion Cultivation. Institute of Hydrobiology 1999. Malinin AN. Optical characteristics of the gas-discharge plasma of working mixtures in an excimer HgBr/HgI radiation source. Kvantovaya Elektronika 2005; 35(3): 243. Sosnin Edward A, Oppenlander Thomas, Tarasenko Victor F. Applications of capacitive and barrier discharge excilamps in photoscience. J Photochem Photobiol Photochem Rev 2006; 7(4): 145. Datsyuk VV, Izmailov IA, Naumov VV, Kochelap VA. Direct electron-impact mechanism of excitation of mercury monobromide in a double-pulse dielectric-barrier-discharge HgBr lamp. Plasma Sources Sci Technol 2016; 25: 045020. Sapozhnikov RA. Theoretical photometry 1977. Efimov AE, Belorukova LP, Vasilkova IV, Chechev VP. Reference book. Chemistry 1983. Pears RW, Gaydon AG. The identification of molecular spectra Chopman Holl LTD: Ldn; 1963. Zaydel AN, Prokofiev VK, Raysky SM, Slavny VA, Shreider EYa. Tables of spectral lines 1977. Prokopiev VE, Yatsenko AS. Energy levels and radiative transitions of neutral atoms 1981; 161. Rhodes ChK. Excimer lasers 1979. Hagelaar GJM, Pitchford LC. Solving the Boltzmann equation to obtain electron transport coefficients and rate coefficients for fluid models. Plasma Sources Sci Technol 2005; 14: 722. Kushawaha V, Mahmood M. Electron impact dissociation of HgX2 (X=Cl, Br, I). J Appl Phys 1987; 62(6): 2173. Malinin AN. Excitation of mercury monohalides in the plasma of pulse-periodic discharge in mixtures of mercury dihalides and rare gases. Laser Phys 1997; 7(5): 1032. Nighan WL, Brown RT. Kinetic processes in the HgBr(B→X)/HgBr2 dissociation laser. J Appl Phys 1982; 53(11): 7201. Malinin AN, Shimon LL. Excitation of the B2Σ+1/2 state of the HgBr* molecules in a gas-discharge plasma formed from a mixture of mercury dibromide and helium. Kvantovaya Elektronika 1996; 23(12): 1077. Malinin AN, Shuaibov AK, Shevera VS. Dissociative excitation of the B2Σ+1/2 states of mercury monohalides by electron impact. Soviet J Quantum Electron 1983; 13(7): 977. Malinin AN. The main characteristics of the plasma of pulse glow discharge in mixtures of mercury dihalides and rare gases. Laser Phys 1998; 8(2): 395. Malinina AA, Malinin AN. Efficiency of quenching of the B 2Σ 1 2/+ state of mercury monoiodide and monobromide by mercury dihalides in gas-discharge plasma in multicomponent mixtures of an exciplex radiation source. Opt Spectrosc 2008; 105(1): 32. Roxlo C, Mandl A. Quenching kinetics for the HgBr* (B 2Σ1/2) and HgI* (B 2Σ1/2, C 2Π1/2) states. J Chem Phys 1980; 72: 541. McDaniel E, Nighan W. Gas Lasers 1982. Erlason AC, Cool TA. On the regeneration mechanism of HgBr/2 in HgBr/HgBr2 dissociation lasers. Chem Phys Lett 1983; 96: 685. Liu CS, Liberman Irving. Chemical Control of HgBr Lasers. Quantum Electronics 1987; 23(2): 245-52. Wadt WR. The electronic structure of HgCl and HgBr. Appl Phys Lett 1979; 34: 658. Datsyuk VV, Izmailov IA, Kochelap VA. Vibrational relaxation of excimers. Phys Uspekhi 1998; 41: 379. Burnham R, Schimitschek EJ. High-power blue-green lasers. Laser Focus 1981; 6: 54.